themail archives Good afternoon Chairperson Allen, and members of the Human Services Committee. I am pleased to testify today on behalf of Mayor Anthony Williams on the framework for transitioning the D.C. General Hospital to better meet our residents need for health care services. Many years ago, when other hospitals would not accept them, the District's needy filled nearly 1000 hospital beds at D.C. General. Generations of District employees have served tirelessly to ensure the best quality care for those most in need. That commitment to caring earned the hospital a special place in the hearts of District residents. However, as access to health care increased and insurance expanded, the demand for services at DC General declined. On average, just over 150 of its beds are occupied. According to the Hospital's own records, the emergency room has seen a 40 percent decrease in the most serious trauma during the past four years. The physical plant has also declined. Over time, the decrease in utilization and neglect of the physical plant have contributed to significant financial strain for the hospital. After three years of cost overruns, the PBC Board of Directors is faced with the difficult responsibility of deciding how to transform the hospital. This transformation must occur in a way that preserves the PBC's mission of caring for the most vulnerable residents of the District while ensuring its financial stability. Over the years, D.C. General has evolved, downsized and transitioned to best serve area residents. D.C. General must now transition again to best serve the health care needs of our community. Faced with imminent closure, the PBC Board voted to restructure D.C. General Hospital. Several proposals to maintain a general hospital were carefully reviewed. Smaller hospital models eliminated critical services including level 1 trauma, while leaving significant numbers of those currently served at D.C. General without any services or resources to receive services elsewhere. These models significantly increase the uncompensated care burden and balances the books on the backs of the poor. For these and other reasons, those models were rejected by the PBC Board. The model proposed here today transitions D.C. General from a full service acute care general hospital with a Level I trauma unit to a Community Access Hospital (CAH) with a full service emergency room, a comprehensive primary care center with limited specialty services and a resource center. Careful research was conducted to determine the feasibility of offering a freestanding emergency room with primary care and resources services together on one campus. The research revealed that there are freestanding emergency facilities currently operating in urban metropolitan areas and in dense suburban areas including Philadelphia, Fairfax, and a statewide system in Illinois. A draft construct has been circulated for comment. This construct describes a methodology for ensuring no one currently cared for at D.C. General will be abandoned. This model preserves D.C. General's commitment to care. All services currently provided to those seeking care at D.C. General will either be provided on site at the Community Access Hospital or by a contracted partner hospital or other health care provider. Those referred from the Community Access Hospital to our provider partners will be welcome and will come with resources to pay for their care. I want to emphasize that this model is very much a framework that will be further defined with community input over the next few weeks. While we have identified the services that this Community Access Hospital could provide, we are still determining, among other elements, contracting mechanisms that the transition will require. We are establishing a taskforce comprised of health care providers and other community representatives to complete the model development process. Now I would like to take a few minutes to describe some of the components of this model. The entry point into the CAH will be a comprehensive triage unit where patients presenting to the CAH will be assessed for severity and directed to the most appropriate location on campus to treat their condition. The EMS system will be supported and realigned to accommodate the need to redirect trauma patients away from the D.C. General location to other Level I trauma centers across the city. However, just like any emergency room without Level I trauma designation, the CAH will be able to treat any patient, including those walking in with serious medical conditions, gunshot or multiple stab wounds. These types of patients needing Level I trauma services will be assessed, stabilized and transferred, with a physician if needed, to the nearest Level I trauma facility. Comprehensive emergency treatment services will be available twenty-four hours per day at the Community Access Hospital. 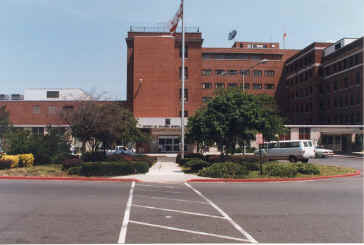 D.C. General's current emergency room with 27 bays is targeted to be the location for emergency services offered through the CAH. The third floor of the facility is already equipped with telemetry and is targeted to provide telemetry services needed for the emergency room. Anticipating the need for blood products for some of the conditions presenting to the emergency room, the CAH will stock some blood products consistent with regulatory requirements and have arrangements with other facilities for additional blood supplies as needed. This facility will be staffed with experienced and board certified emergency physicians and experienced emergency room/trauma nurses. Additional staff support may include trauma PA's, paramedics, EMTs, and LPNs. The staffing planned for the CAH is consistent with staffing levels of similar facilities surveyed and visited. The CAH will be able to treat all types of presenting conditions including chest pains, lacerations, asthma, seizures etc. Patients will be treated for the presenting condition and released or immediately transferred to another hospital for admission. Alternatively patients may be observed for a maximum of 36 hours and either released or stabilized and transferred. This plan requires contracts with other area hospitals to ensure the availability of hospital beds in particular ICU/CCU beds. At least two hospitals in the District have committed to fill the void for inpatient beds including ICU/CCU capacity as required under this plan. Discussions are currently under way with these hospitals and other management entities. Negotiations could be completed within the next several weeks. For this plan to be successful, it is critical that there is a supported realignment of the EMS. A task force has been convened for this purpose. This task force has completed its assessment and determined the cost of restructuring EMS is $2.4 million. The workplan developed by this group will be incorporated into the implementation plan. In addition to the emergency treatment capability, the CAB will offer a comprehensive DC Qualified Health Center (DCQHC). The DCQHC will be certified based on standards developed by the Department of Health. This center will be open 12 hours a day to accommodate appointed, triaged and walk-in patients. Patients seen in the emergency room will be treated and released for follow-up to the primary care provider with whom they already have a relationship. However, the DCQHC will become the primary care home for those patients who do not currently have an established relationship with a primary care provider or for the patient that selects the DCQHC as their primary care home. In addition to comprehensive primary care services, the DCQHC will offer a comprehensive disease management and prevention program for diabetes (including opthamology, podiatry, diabetes education) and cardiovascular (including ECHO, Ultrasound, Stress Testing, EKG) disease and a dental clinic focusing on general preventive dentistry and some limited oral surgery. Additionally, there may be other specialty clinics offered where the current volume indicates that such a service is needed on site at the CAH. Other chronic and specialty care will be provided through contracts with other providers and facilities. It is anticipated that all service decisions will be made within the next couple of weeks. Through the Community Access Hospital, all patients will be connected with a community-based primary care facility on-site or in their neighborhood. This will serve as their primary care home The District has already committed $14.5 million in capital improvements for upgrading and expanding its clinic network, focusing on communities East of the River. We will redirect resources to ensure all patients are welcome. The dollars must follow the patients. Additionally, plans are underway to expand health insurance coverage so more District residents will have the dignity of choosing where they receive health care. The CAH will have a clinical laboratory onsite that performs basic laboratory services needed for routine diagnostic and examination. These services will include but may not be limited to chemistry, hematology, serology, stat microbiology and urinalysis. Other services not performed by the on-site laboratory will be provided through the Department of Health's clinical laboratory or another appropriately credentialed lab in the area. Limited radiological services needed to perform and interpret radiological examinations for the diagnosis and treatment of patients seen in the CAH will be available on site at the CAH. In addition to diagnostic radiology the CAH will provide ultrasound and limited guided CT procedures as it relates to the comprehensive disease management programs provided through the DCQHC. Pharmacy services will be available on site. Since the CAH will not offer comprehensive hospital or specialty care on site, referrals will be made to area hospitals and other contracted providers. There are currently two hospitals that have committed to accept all referrals needed for the uninsured. Recognizing that the hospitals will want to be reimbursed for some if not all of the services provided, the current plan calls for the dollars to follow the patient, thereby insuring that the uninsured patient has resources for all needed health care services. Plans are currently being developed to determine the process for referring patients into (from private clinics and other providers for ancillary services) and out of the CAH for all services not provided on site including acute inpatient hospital admissions. Under this plan, the DC Jail population would be treated at another facility in the City. Other facilities have committed to accept this population. The current plan anticipates being able to provide the equivalent of health insurance for the current uninsured populations served by D.C. General. Each individual that has no other health coverage will be enrolled in the CAH "Health Care Access" program and receive a personal identification card. This card will entitle the individual to receive services at the CAH and referral services at contracted hospitals or providers. This first phase of the District's plan to provide continuing coverage for the uninsured will be followed by a progression of Medicaid expansions. The ultimate goal is for every citizen of the District to have unrestricted access to health care. There are two feasible options for managing this program-PBC Board (either directly or through contracted arrangements) or ASO management. These decisions must be made over the next several days. If an outside contractor is to be used for management, an RFP will need to be issued. The current plan as developed is manageable within the current PBC subsidy. The current model as developed is manageable within the current PBC subsidy. We estimate that the Community Access Hospital will have an operating budget of approximately $9 to $10 million annually (including contracts for trauma I care and EMS enhancements); $21 to $22 million for inpatient care; and $4 to $5 million for the Primary Care Center. Thirteen million of the PBC subsidy supports the neighborhood health centers and will continue to be available for the health centers. The balance of the subsidy including the PBC's DSH payment will support the CAH and all other contracted services. As it is anticipated that there will be a need for transition funding, all one time transition costs have been identified by the CFO. These costs will include transition costs for the hospital, administrative restructuring, capital improvements, EMS realignment costs, and operating capital for the hospital until the transition is complete. A comprehensive implementation plan has been developed. Major tasks have been identified with expected completion dates for each task. The implementation plan is modified weekly with indication of new tasks, revised dates and other information as needed. The implementation plan will be used to guide the project to completion.